← RECOMMENDED: Insomnia White Wine Blend, California. Around $10. wine yet, here’s a quick recommendation: the 2010 Cryptic red blend. It is delicious, inexpensive, and fun, with backwards lettering and scramble puzzles on the label that you must decipher in order to determine the blend. 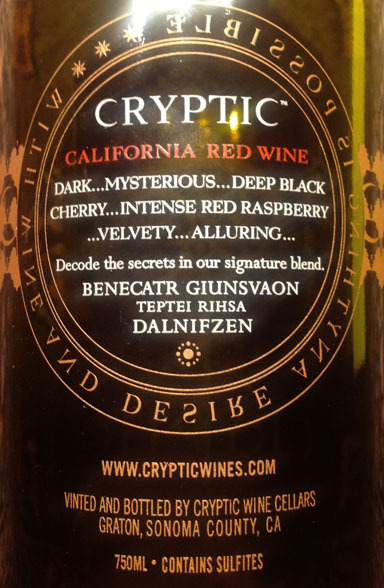 NOTES: Cryptic refers to the mysterious alchemy that comes from combining individual lots of wine together to create a magical blend. The three Cs on our encryption wheel each represent one of three varietal components: Zinfandel, Petite Sirah, and Cabernet Sauvignon. Each grape varietal adds a unique characteristic to the blend, and when blended together the result is unexpected and unique. Cryptic is sourced from vineyards we control and from grapes we crush from [more than] 30 different vineyards. These vineyards are located in three distinctive growing areas: Amador County in the Sierra Foothills, the Lodi River Delta and Paso Robles in the Central Coast. Each of these areas is known for soils, climate and growing conditions that produce big, rich and bold red wine grapes. Cryptic sets the mood for a magical experience to be shared. Complex, supple and seductive, with ripe raspberry, dark blackberry and blueberry flavors, notes of toasted hazelnuts, a hint of vanilla and a touch of mocha on the finish. WINEMAKER: Alex Cose studied finance and worked for Wells Fargo for six years before a change of heart landed him a harvest internship at Monticello Cellars in Napa Valley. After a return to college, another couple of internships and a degree in Enology from Fresno State, at 27, he was cellar master at Peter Michael. This entry was posted in Cabernet Sauvignon, California, Petite Sirah, Red Blend, Zinfandel. Bookmark the permalink. 2 Responses to RECOMMENDED: 2010 Cryptic, California red blend. 14.5% ABV, $18 SRT; available for less. I’m all for good, cheap wine. Sometimes it can be unbearably expensive and while on vacation, that just isn’t cool! I was just in Florida and some wine was so expensive, I had to pass it up. I’m originally from California and that is some solid wine at an adequate price! Just gotta know where to look! The Central region of Florida had some good wine surprisingly while i was there visiting. I was in Palm Bay at the Palm Bay Hotel (www.palmbay-hotel.com) and it was great and actually really affordable. Lots of good little wine spots all over!